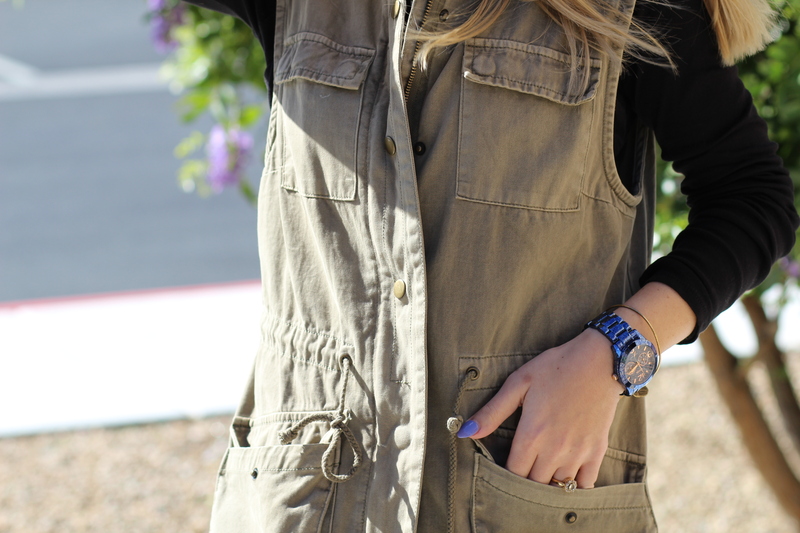 One of my favorite multi-purpose pieces for the season is this cargo/military vest. It was a great Marshalls find I purchased in the fall of last year. Not only a vest is a perfect item for spring, but this one is pretty comfortable for running errands on the weekend or even going to work assignments during the week. The look I’m featuring below is pretty casual. However, with a pair of stilettos, a skinny dress pant and a nice satchel, you can create a more sophisticated look. The shooties are probably the pair I get most compliments on. I snagged them on sale as well from Anthropologie, but you can find similar ones out there on Zappos.com or Nordstrom Rack. As you can see I don’t like paying full price for anything, especially brand name items. I’ve gotten pretty savvy about it over the years. If you have any questions or are looking for something particular but can’t find it at the right price, email me and I’ll be happy to assist you with your shopping needs.